Designer Tibor Kalman's umbrella opens to reveal a brilliant blue sky underneath a wonderful waterproof arc. Even as storm clouds loom overhead, beneath this iconic umbrella by Tibor Kalman and Emanuela Frattini Magnusson, clear skies are always on your side. As a founder of M&Co and editor of Colors magazine, Kalman gained major attention throughout his career for "pushing the envelope" on design and typography conventions with bold visual language that was confrontational, surprising, and distinguished by the designer's keen sense of humor. 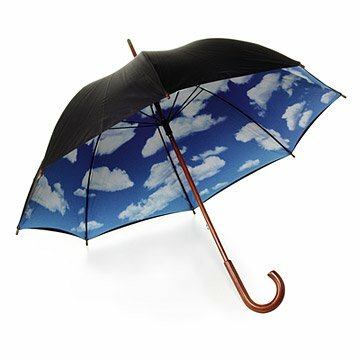 Like Kalman's other pieces found in museums around the world, his Sky Umbrella deftly captures the wit and irony that characterizes the designer's revered oeuvre. A plain, black canopy and a simple wooden handle unfurl to reveal a cheerful blue sky scattered with fluffy, white clouds, bringing delight on even the rainiest of days. Sturdy nylon covers the photo-process-printed polyester sky. Durable wooden shaft and handle with a manual open-close mechanism. Made in China. Everything I wanted to replace my trusty old umbrella that finally had to be retired. I needed a quality umbrella to replace a competitors unit. I was happy to find this beauty from MOMA. I Love My Blue Sky Umbrella! The occasion for my purchase was the demise of my previous Blue Sky umbrella, which I bought from The Museum Store 15 years ago. It finally rusted a spoke and I needed a new one. Yours is sturdier and better made of nicer materials, and I was in love with my previous umbrella, so you can guess I'm over the moon about this new one I've just bought from you. I specifically sought this one out, it looked like the nicest one I was seeing online, and I'm very happy with my purchase! Especially since it's so rainy and windy this winter. I'm using it a lot. This umbrella is very nice. It appears to be great quality, which I hope will last me a very long time. The one thing I have noticed is that the top (black) material collects a lot of water so once you put it down after having used it in the rain, there remains a lot of water on the outside and you have to shake it out or tap it down before bringing it in anywhere. Otherwise you will have quite the puddle on the floor wherever you place it. Despite this small aspect, this is a great umbrella and I look forward to using it for many years to come! It really is like a sunny day! My teen daughter saw this umbrella last year and talked about wanting in for so long I finally decided to spend the money on it and buy it for Christmas. She was thrilled with the beauty of it and we were all impressed with the quality. It is strong and sturdy, with a double cloth lining, full wooden handle, and what appears to be a brass tip for protecting the end if used as a cane. This umbrella will most likely serve her for many years. This umbrella is such a good idea - who doesn't want to look up in dreary gray rain and see blue sky and fluffy clouds instead? I get a ton of compliments on it every time I use it. It is extremely well made with a wooden handle that feels very solid. Last umbrella I will ever buy. I bought this for my daughter-in-law, but I loved it so much that I kept it for myself and ordered two more for gifts. It is a very well built product.